A black hole is a place in space-time where gravity pulls are so strong that even light cannot get out, it is therefore “black” in any bands. The theory of general relativity predicts that a sufficiently large and dense mass would deform space -time and give birth to a black hole. Despite its invisible interior, a black hole can be indirectly inferred and investigated at various wavelengths through its interactions with the surrounding and in-falling materials. It is known for decades that very heavy black holes inhabit the centers of galaxies (including our own galaxy, the Milky Way), but are hidden by gas and dust. Some of these black holes can “eat” materials from their environment, and emit a lot of light during this process. Most of these “luminous” black holes are surrounded by large amount of gas and dust, distributed in a doughnut-like structure. Such a structure could resemble a pantry, which guarantees that the black hole can keep eating, radiating and growing. However, it is not known where exactly this material is located, and what the relationship is between light produced by the black hole and the dusty gas. In order to address this long-standing issue, Dr. Claudio Ricci, a postdoc fellow supported by Chinese Academy of Sciences South America Center for Astronomy (CASSACA), and his collaborators made use of observations carried out in the X-ray band, similar to what is typically used for radiographies in hospitals. With each observation performing these “space radiographies”, they could measure the amount of material around the black hole, and then study its evolution. This project started in 2013, and it took the authors many years to create the large database used for their research, using data from space telescopes as well as ground-based observatories, such as those in Chile. The Chilean telescopes were extremely important for measuring the properties of the black holes, and in particular, for “weighing” their masses. The main X-ray instrument used was the NASA satellite Swift, but also data from the satellites XMM-Newton of ESA, Suzaku of JAXA, and another NASA telescope, Chandra, were used. In the optical band the facilities used include the Sloan Digital Sky Survey, the UK Schmidt telescope, Gemini, CTIO, DuPont and SAAO. With this work, Ricci and collaborators discovered the process that controls the interaction between light produced by the black hole and the gas that surrounds it, and showed that most of the material around black holes is located close to it. 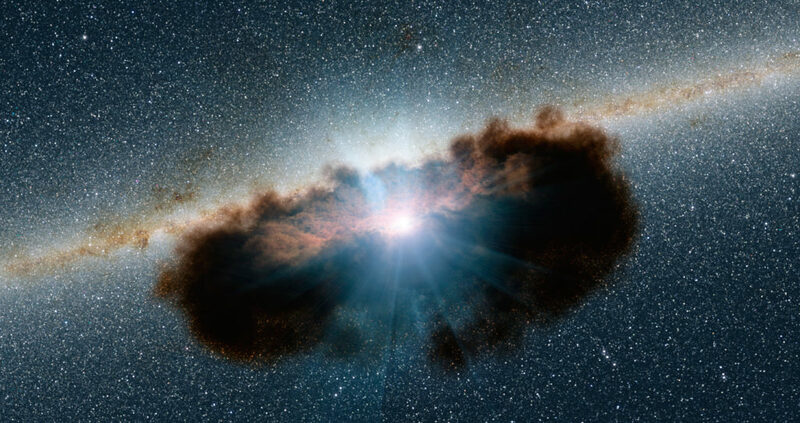 The authors found that, when the black hole emits a lot of light, this light pushes away the material from its vicinity; in other words, the gas can “evaporate” because of the large amount of energy released by the material falling rapidly onto the black hole. This could also mean that, if the black hole “eats” too rapidly, the energy produced could destroy the “food” available for the future. It is a major step forward to reveal a clear picture of the connection between radiation feedback and the surrounding material’s shape. “The next step will be to further understand the details of this behavior, and what happens to the material that is pushed away from the black hole”, said Dr. Ricci, the leading author of this work. Figure 1. Artistic impression of the gas and dust surrounding an accreting supermassive black hole. Taken from NASA/JPL/Caltech. Figure 2. Schematic representation of the material surrounding supermassive black holes for different ranges of Eddington ratio. 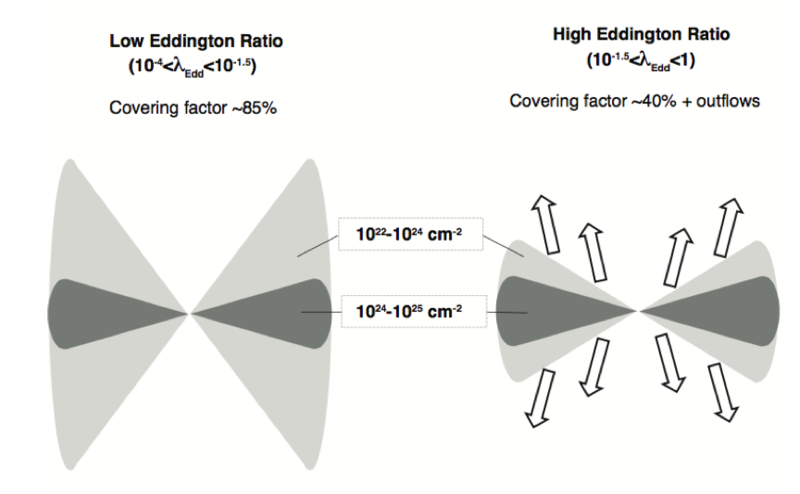 The Eddington ratio is the ratio between the bolometric and the Eddington luminosity, where the latter is defined as the luminosity at which the radiation pressure from a source, in this case the accreting SMBH, balances the gravitational attraction. Taken from Ricci et al. (2017, Nature Letter).